Holy Thursday 1932: procession with the blessed oils. The cathedral still in construction is to the left. 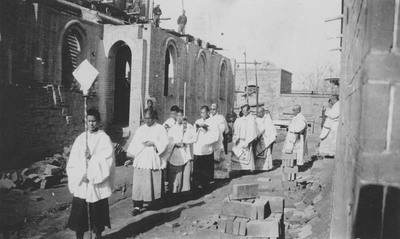 Chinese priests and laymen in ceremonial outfits. Holy Thursday procession. March 24, 1932. Société des Auxiliaires des Missions (SAM) China Photograph Collection, Whitworth University Library, Spokane.